Florals for fall? There is no need to shove your prints to the back of the closet this upcoming season because these bold patterns can confidently be worn all year round. brightly coloured roses, geometric shapes, and pastel paisleys are no longer exclusive to the warmer months. Whether your style consists of mixing and matching boldly patterned tops and trousers, or making a statement with one single yet exciting piece, this season, get ready to fall in love with prints all over again! Whether you are looking for the perfect pair of jeans to sport on casual Fridays or are wondering just how oversized your denim jacket should be, everything goes! Denim is so in this season – from rhinestones, pearls, and embroidery to country casual both light and dark washes are trending this fall. 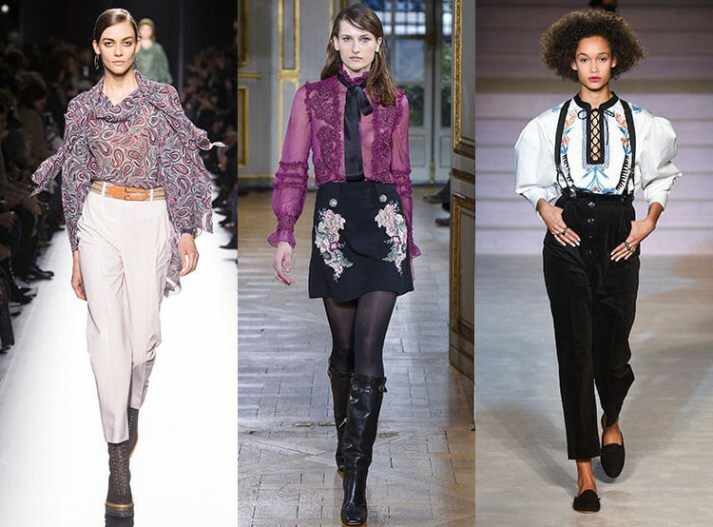 This upcoming fall season showcases a wide variety of fab blouses, from modern classic styles in all the highlight colours to every print imaginable. 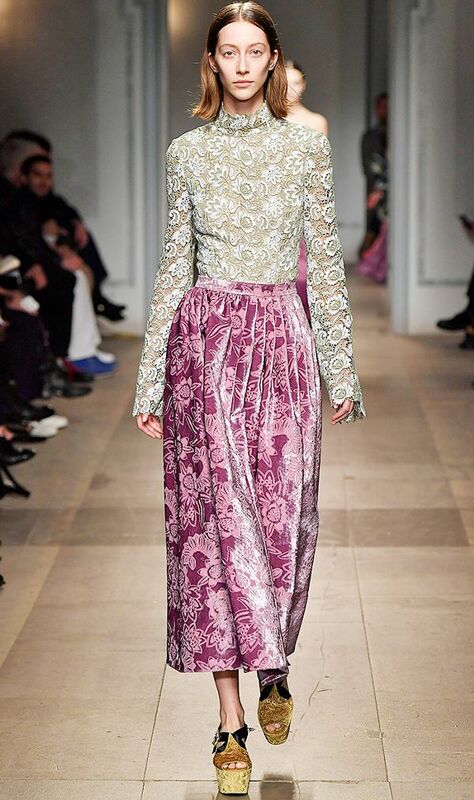 Printed or plain, sheer or satin, the blouse is certainly a fall essential. From a day at the office to a night out on the town, this is a piece that can be seamlessly transitioned and styled in a never-ending number of ways. Pearls are not just for necklaces anymore. This upcoming season, it is all about wearing pearls anywhere but around your around neck. From handbags to heels, these little white gems have been making their statements all over the runways. Pearls have the power to add class to just about anything. Of course, the pearl necklace will always be a staple item for every chic woman; but for the time being, don’t shy away from trying something new and exciting. Since 1966, when Yves Saint Laurent shook up the fashion industry by presenting ‘Le Smoking’ jacket to a world that was not yet used to women in pants, variations of this style have continued to be a must-have in every woman’s closet. Great novelty jackets, which have drawn their inspiration from YSL’s ‘Le Smoking’, are what should be draped across your shoulders this upcoming fall season. With styles ranging from long to short, fitted to oversized, and plain to patterned, there is surely something for everyone. Whether it be with a dress, a purse, or some fabulous booties, let velvet be the staple fabric that holds your wardrobe together this coming season. Of course, there are countless options to choose from besides red velvet in the fashion world, which makes this trend even more fun to follow. This coming fall, it seems that the smallest elements are making some of the biggest fashion statements. Culottes with ruffled hems, blouses with ruffled bell sleeves, and dresses ruffled from top to bottom are all part of this ultra-feminine trend. In addition, lace details are found on necklines, hemlines, and entire dresses . Easy Waves – These waves are like you’ve rarely seen them: long, laid-back, and easy all around. Curly Bangs – If you have curls and ever thought bangs weren’t for you, let this season sway your opinion. Because bangs do work for every texture. Shag – Yes its back and you’ve probably heard of the “shag” by now, and the models on the Saint Laurent runway were rocking the cut. It’s a little rock ’n’ roll, a little playful, and very cool—especially if you’re naturally curly. Deep Side Part – The no-nonsense hair is sleek and sophisticated, chic and tidy but without an oily look. 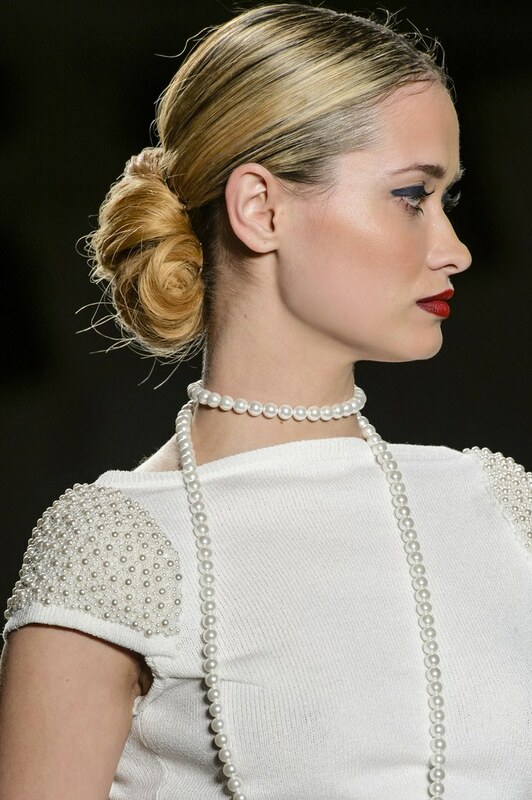 Vintage Buns – The forties-inspired, double-bun looks so hot in blonde! Pretty Updos – two hair looks: twisted and the crown braid which is much easier than it looks. Just part your hair down the middle, braid a fat plait on either side, and then crisscross them around the front of your head. Leave out a few strands to keep it from looking too perfect, which would take away from the romantic vibe. Vintage Bun in Fall 2017 Blonde!